AJ emailed me and said that the VT1+ is the same as the new Gen 2 kit. Really fast response, I'm impressed with ESS. Read all thru the install instructions. Fairly straight forward and easy. Uses STOCK injectors. No instructions to change out the injectors. Very interesting. -Are there 6 new injectors included in the kit? Most interesting is that it looks like the SC housing could be 'clocked' so that the outlet is up high and pointing backwards. This could then go right into the TB and then into a custom intake manifold with an intercooler inside the manifold, similar to the B58 intake manifold. Yeah, great dude, he's the one who helped me. Pretty quick on the response time for sure! 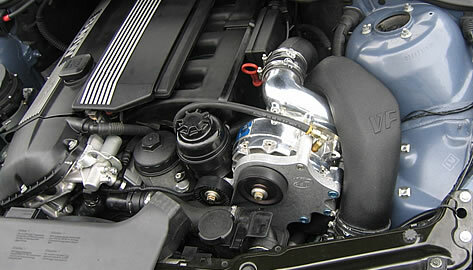 The supercharger in/out compressor housing itself can be rotated. There are multiple bolts around the outside of the housing which are loosened and the housing itself is rotated and the bolts are re-tightened. The SC still mounts just as usual. What this does is change the outflow position. The ESS is setup with the outflow on the bottom. I am saying loosen it and rotate it so that the outflow is on the top pointing backwards. This won't work/do anything on the ESS kit but would just have the outflow on the top which could then be plumbed into a custom intake manifold with a built in intercooler. Here is a picture of what I mean-SC outlet on top. So if you were able to do this, you'd be able to venture the possibility of an intercooled manifold?! There is a used VT1 kit on ebay now. It has a 130mm(5.12") pulley. That sucker was sold immediately. Yeah, I offered $2k and was declined. Bob@BPC, when you guys worked with Moser, did you guys see said paste? Thank you for very detailed pics. First off congrats on the purchase and thanks for sharing the pics! I'm curious as to why the supercharger has a braided line attached to it when it's supposed to be a self contained version? Although it is self contained, I'm GUESSING its possible to lose some of the oil inside the unit, someway somehow... I'm honestly a newbie when it comes to this fancy stuff. Never had a FI car or FI equipment for that matter... Glad they supplied some oil with the kit though! Moving forward with this, will definitely teach me a thing or two. It's a drain for the SC oil. The fill is on top of the SC housing, drain on the bottom where you can't get to it unless you pull the SC. They recommend oil change every 7500 miles. So it is just for ease of oil change/drain. I figured as much, thanks for the clarification. Any chance switching to the N54 intake mani could prove worthwhile? Happy for you man, enjoy that boost! Have honestly thought about it! I know 2 different beasts entirely, but Alice also has an n54 manifold, and I wonder if it would benefit my car as well in the grand scheme of things. And of course follow it up with a 3.91 diff like big had mentioned in his n54 manifold write up. Well I believe the 3.91 would be great but only if you run the 7500rpm redline. Can you do that redline with the SC? If so then for sure do a 3.91 with LSD. Your shift points at 7500 would not be bad at all the 2-3 shift will be around 58-59mph, 3-4 shift like 92-94mph. About the same as 3.73 rear diff with stock redline. Not recommended if you drive on the highway. Yeah, not too much of that for me here in VA. However, live close to what would be the sticks in TX have to take the highway to get anywhere... The main plan if I was going to get an actual lsd was to get a 3.64 as a happy medium. But I need to read more on the types. Pete gave ne a nice TLDR about ramps the other day. Just picking between what I've seen on diffsonline. But thats another big buy that probably wont happen for a while after the kit gets installed.. But I've known a few people with the Diffsonline diff, and I've heard good things. I'm more of a Wavetrac guy though, I'll be (maybe) looking into them. I didn't know that they didn't work with the DTC. But for me, I like the fact that the Wavetrac and other ATB diffs are basically maintenance free. I'm a set it and forget it type of guy.